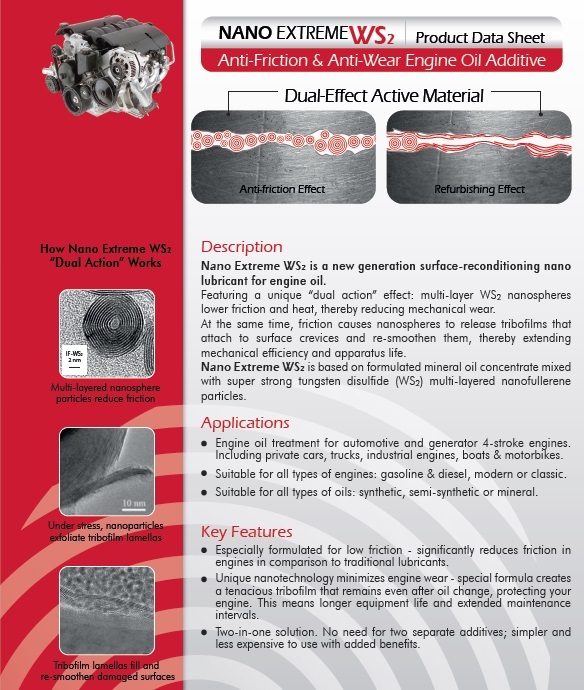 Nano Extreme WS2 engine oil additive is based on proprietary anti-friction and anti-wear nanotechnology. The additive is based on award-winning research developed at the Weizmann Institute of Science. Its lubricious properties are due to pioneering inorganic, multi-layered fullerene-shaped Tungsten Di-sulfide nano particles which reduce friction and heat, thereby reducing mechanical wear. The innovative nano particles feature a unique continuous tribofilm creation mechanism that helps repair wear damages by coating moving engine parts with lubricating layers. This technology is especially efficient under extreme pressure and temperature conditions and thus has an outstanding capacity to improve engine performance, improve power, extend machinery life and reduce downtime. These translate to significant cost and performance benefits such as lower energy consumption, extended effective operation of mechanisms, extended lubricant life, extended machinery life, and reduced emissions. ​Watch why Nano Extreme WS2 is different from others?